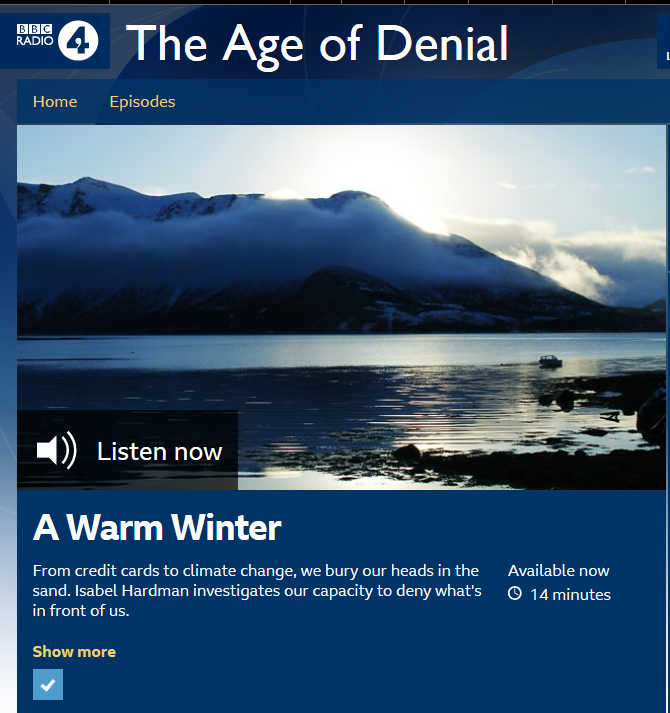 Isabel Hardman has a new five part series on Radio 4, called the Age of Denial. You can listen to the first five minutes, but to give the gist, Norgaard visited a small town in western Norway in the winter of 2000/01, to do research for a book she was writing. She found that the winter that year was a mild one, with the snow arriving late. But what really stunned Norgaard was that none of the locals wanted to talk about “climate change”, which she was convinced was to blame. Hardman and Norgaard then discuss various reasons why this should be so, which amounted to no more than a load of psychobabble. For some reason, it did not occur to either to ask what the locals knew already. That it was just the sort of weather event that they, or their forefathers, had seen in the past. In reality, you don’t need to be a psychologist to understand why so many people are suspicious of what they are told about climate change. The answer lies in the fact that they see no evidence on the ground to support the barrage of apocalyptic warnings showered on them. People who live near the coast can see with their own eyes that they are not about to be inundated by the sea. Temperature rise has been so small in the last century that most people would not even be aware of it if they were not told about it. As for extreme weather, older people know that there have always been floods, droughts, heatwaves and storms. Sadly it is the younger generation, who have no such experience, that is vulnerable to propaganda. Rather than trying to package sceptics as people with psychological problems, she might ask why others have become totally paranoid about climate change. When I see school kids questioning the point of going to school when “their future could be ruined by climate change”, I truly despair. It is a sort of mass hysteria that has unfortunately been all too common during human history. It used to be a matter of burning witches, or human sacrifices by the Aztecs. Now it is demonising CO2. Perhaps Isabel might like to devote her next series to this. I suppose this time she didn’t try to drive there in her BEV. I know I get a tad repetitive, but can I simply ask Paul why the readers of this article who are appalled at this example of blatant propaganda , and all the others that the BBC constantly spurt out, instead of just moaning on, consider it is THEIR fault because they continue to accept and fund it. It is an optional tax, unlike most of the the others. If you, dear reader continue to pay, you have no grounds to complain. So stop whining, and stop paying. It is pernicious that you have to pay the BBC licence tax even if you dont watch the bbc. If you watch freeview channels and maybe RT and Al Jazerra to get actual news, the Govt demands you pay tax to BBC. With the greatest respect bobn off-air media via radio waves is ‘old hat’. You only need to pay if that’s how you get your pictures. All the stuff you mentioned, and pretty much everything else, plus a lot more, is available via the interweb pipe. Look I’m not some gormless teen, dabbing my greasy fingers on screen to communicate my witless ideas – hang on, ok well not the first bit – I’m over 60, if I can work a smart TV so can everyone. Get on with it, stop bl..dy funding the bar-stewards. Paul, I agree with you, of course they will but, always a but, it IS the point ! The BBC holds a totally undeserved preeminence and respect in this country, unbelievable but true. It does this because it is huge, and it is huge because people continue to pay them when they don’t need to. It got this way because in the past you truly have to pay them if you wanted any TV entertainment. Today you simply don’t, there is a total world of entertainment, news etc out there, that you don’t need to pay the BBC for the right to watch. The old world has changed. If I find that a particular brand of biscuit is sh*t not chocolate I don’t keep buying them, and them moaning about it, it would be total madness, would it not. I would buy something else. I really wouldn’t give a toss if Sh*ttyBix (trade name protection applied for, just in case) kept churning them out cos I’ve got a big stash of Penguins in case they go extinct. Ditto the BBC which is 99.99 % utter rubbish. Stop paying, stop looking, and in your case Paul get back to the science !! Of course if your readers do actually need continuous doses of the asinine cr*p the BBC call entertainment/news etc – I suspect the climate case, the Earth, hope, humanity are all doomed. There is by the way plenty of asinine cr*p on Netflix !! Sadly the vast majority of the public still get the bulk of their news from the BBC. I do not watch or listen to the BBC unless I am in someone else’s environment (home, car, pub – to watch the rugby, the only voluntary viewing I do). I very rarely even view any of their news web pages, and only when there is no other source: I am fortunate in being able to read the news in several different languages, though I find the creeping censorship imposed by GDPR a pain. Nonetheless, I feel Paul provides a valuable service, which entails monitoring BBC output. I frequently link to his posts that rebut their nonsense in the hope that more people may discover for themselves that the BBC produces propaganda, and that those who know this can emulate me. Do not attack the messengers who congregate here: be one yourself. Trouble is the hysterical people have taken over the media, government’s and politicians . Unfortunately B.S. has become the norm and the people who peddle it are disappointingly in power. I listened to this program live quite unintentionally. I was enraged at first, but as it went on, the psychologists began to contradict themselves. They were propagandising denialism with logic reminiscent of those who persecuted black people in the deep souther states of America in the late 19th Century. Their own denialism and bigotry was profound, and presented with child like logic and quiet, condescending, religious zealotry ‘You is black so you is bad’. No science presented, no examination of climate change, no acceptance that anyone could possibly have a genuine alternative view on the subject, simply that sceptics were to be pitied because they exhibited various clinical signs of denial. Indeed, by the end of it, whilst still angry, I was laughing at the obvious contradiction they campaigned as being that of their own, pitiful denial. Anyone with even a tenuous grasp on reality would have understood they themselves have the problem they are accusing sceptics of. It was truly pathetic. So, nothing much to worry about here. There will be plenty of right minded people who will recognise it for what it is, a show for the religious climate faithful. It will probably persuade those right minded and curios people to seek some clarification rather than blindly follow the psychobabble of these idiots. The BBC shoots itself in the foot once again. Sad to see Isabel Hardman pushing this rubbish. She always seemed to have a healthy scepticism of politicians and their BS in her pieces on BBC’s ‘This Week’. Oh well. I guess he who pays the piper calls the tune – and the BBC certainly wouldn’t fund anything that questioned climate change hysteria. The BBC killed 2 birds with this series, the CC propaganda, and the fake balance of employing a supposedly “right wing” journalist. Matthew Paris is popular with the BBC for the same reason, a former Tory MP who has decidedly gone native. I was sickened by this programme. Linking climate skepticism to Holocaust denial while denying that they were doing so. Such pompose certainty and condecension. On a positive note, the more they do it the higher they climb then the harder the fall. They can promote ‘climate change’ all day long, but it doesn’t tell us anything about the reasons for it. They assume those, then claim it’s all settled science, which is tripe. Only yesterday I was reading a piece in the Mail about a new book on the subject of the death of Adolf Hitler and Eva Braun. Amazingly there are lots of people who still try to say that they were flown out of Berlin and lived happily ever after in various places, especially South America. The writer comments that they ignore all the available facts – the new book provides the conclusive dental evidence that the burnt remains were found by the Soviets in the Chancellery garden – showing they are wrong and that they are promoting a ‘belief’. Sound familiar to anyone here? And wherever there is plausibility there is possibility and inevitably person or persons with some sort of vested interest — psychological or financial — in believing it or having others believe it. It would seem that humanity, or certain sections of it at least, are hard-wired to believe in conspiracy theories. Don’t ask me why that is; I haven’t a clue. I think it’s something they put in the water, you know! Why oh why are so many people in such total denial about this? The real reason, because it isn’t true, just never occurs to them does it? The real “deniers” are the believers, because they totally cannot take on board any contrary evidence and they have absolute faith in “scientists say”. These kids (and their parents and teachers) will quite happily believe, for example, that polar bears are struggling to survive and will pass around the starving polar bear pic. Just what I was about to say. I’m always wary of pathologizing disagreement, but since the other side started it, it seems to me that it’s the alarmists who are demonstrating behaviour more closely resembling psychological denial at this stage: none of the catastrophic predictions of the last thirty years has been borne out, let alone the more technical ones of the “atmospheric forcing” hypothesis, yet still they refuse to waver from their doom-mongering. It annoys me that merely to question the veracity of claims about “climate change”, is to be branded a “denier”. The motto of the Royal Society is “Nullius in verba”, or “take nobody’s word for it”. All scientists should adopt that approach. Which makes them total hypocrites as they push Climate Change with all their might, much to the annoyance of their members. Paul, I know it is only one one, but this is a little ray of sunshine from down under. Hi Paul. You have put your finger on THE most important point about the short term ie, 30-40 year ocean cycles, that caused both the 1920s-1940s and the current Artic melt. 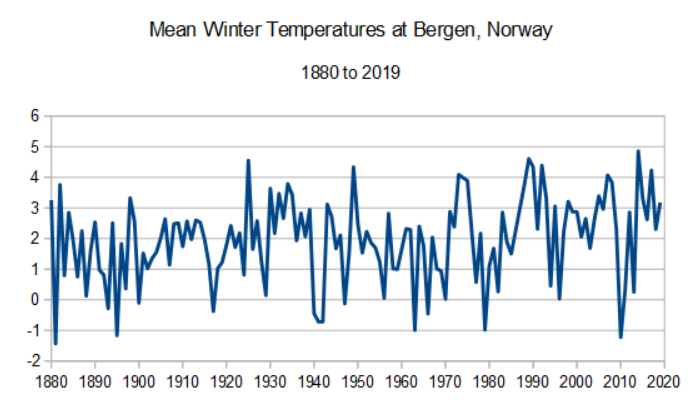 The old timers in that Norway town, who were accused of denialism in not wanting to talk about ‘climate change’ being the cause of a particular warm winter to the climate alarmist interviewer, due to them being aware of the cold thirty-year period that followed the warm 1920-1940 period, are either all deceased now or the few that remain are simply not bothered trying to explain to the young generation that shifts in climate are natural. The current generation in their seventies have only known an early cold childhood and cold early adulthood followed by the warmer period 1980-2020. Such is the relentless propaganda by academia and in the media that even if we have a similar cold period to the 1945-1980 that it will be massaged away from public discourse. There is an app called inconvenient facts for Android phones. Apple banned it. Has a handy list of facts and their sources. Well worth it. I have written to The Times today on the subject of their report detailing Paul’s interactions with the BBC, the eight rebuttals. Perhaps, rather than acting like a mad sect filled with stubborn refuseniks, we ought to send the press more of our findings and the scurrilous reportage that the general public have had thrown at them. Presumably psychologists also know about “groupthink”. I’m sure a psychologist understands Norwegian natural weather variation. It’s like asking the plumber an opinion on stock rates. Sure, the plumber is unerring as the media does good work to keep hem informed on which companies will grow like, say, Barings. There is no chance anyone would spread misinformation to the media, so the plumber knows. We should not underestimate hir intelligence. I am reading 1984 at the moment and it seems to me that the BBC is trying to implement “Big Brother” and rewrite history and control everything the population thinks. Wake Up!